We can offer you all Toshiba ac adapters directly from the manufactorer. Direct purchase from Toshiba enables us to offer you fast delivery times and competitive prices. 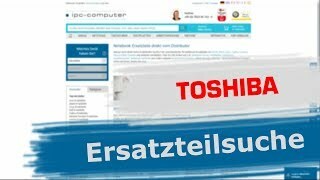 We sell only original Toshiba power supplies in our shop. Thus you can be sure of the perfect compatibility and you are on the safe side with original charging cables from Toshiba. We also have almost all Toshiba notebook AC adapters in stock. In addition, all power supplies are supplied with the appropriate power cable. The original AC adapters from Toshiba in our shop all carry the CE marking and have passed all safety relevant tests. In addition, the power supplies also have a built-in overheat protection and overcharge protection. Thus, the use of original Toshiba power supplies also ensures full safety. The use of original Toshiba charging cables also guarantees the compatibility of notebook and ac adapter.